Seymour and I have been hitched for 10 years. This does not seem possible. The least believable part is that such a sweet, creative, handsome (in a weak knees way), kind, intelligent, sympathetic guy has held on this long to a soul-destroying emotional black hole. Maybe it's the rack? More likely it's because I can still make him laugh, or that he gets off on the adrenaline jolts dished out daily. I don't deserve him but I do absolutely adore him. 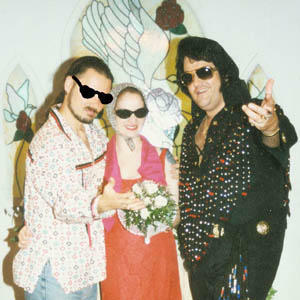 Wedding attendees: no of course this is not our actual wedding picture. Though the official event set the standard for Catholic church, white dress, and hotel reception style events, this picture--in which we are renewing vows on our first anniversary--is truer to what we'd have liked, had we not two very enthusiastic mothers on wedding rampages.